BEMCo’s organizational structure and operation follow the provisions of BEMCo’s constitution and operating rules. 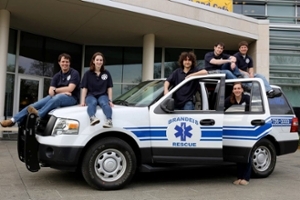 Charged with maintaining BEMCo’s high level of service to the Brandeis community, the six elected members of BEMCo’s Executive Board (E-Board) are responsible for organizational oversight, personnel management, and day-to-day operations. Two supervisors oversee medical scene management and perform weekly quality assurance and continued quality improvement sessions with our medical director, Dr. Debra Poaster. The approximately 80 (50 active) student members of the corps are all Massachusetts-certified Emergency Medical Technicians (EMTs). The minimum training for an EMT involves a 130-hour contact course, practical experience, and a state examination. BEMCo provides additional training to prepare members to handle the kinds of emergencies that are common on campus and maintain proficiency. The standard on-duty crew comprises four EMTs with specific roles: The Primary, Secondary, Tertiary, and Supervisor. A promotions board oversees the rank advancement of BEMCo members. The Secondary has had extensive training and is familiar with all BEMCo protocols. Should a second (simultaneous) call arise, the Secondary will break off from the first call to respond to the second call with the Supervisor. The Tertiary is a new member who participates fully until he/she is ready for promotion to Secondary. Both the Secondary and Tertiary respond to the scene via foot, personal vehicle, or campus police cruiser with a full first response aid kit and communications equipment. A Supervisor is always on duty to respond to simultaneous calls (with the Secondary), as well as any call of a serious nature. Two or three Supervisors are appointed to one-year terms after acceptance from the outgoing Supervisors and the BEMCo Medical Director. The 2018-2019 Clinical Supervisors are Allison Lewis and Benjamin Merker.